Its time for action again! Call them and tell them NO! to a Article V convention an extremely STUPID idea. As you know, yesterday the North Carolina House voted against the COS application for an Article V convention. We won by 6 votes. But a few hours later, COS and the treacherous Republican leadership got the members to vote to “reconsider” their vote against SJR 36. So they brought SJR 36 back to life and sent it to a House Committee. There it will wait until COS and Republican leadership twist enough arms and pressure more House Republicans to vote for it. It has always been the Right which resisted the periodic pushes for an Article V convention. The Right understands that delegates to an Art. V convention have plenipotentiary powers and can exercise [once again] that “self-evident right” recognized in the 2nd para of our Declaration of Independence, to throw off the Constitution we have and set up a new one which creates a new government. So the Left changed clothes and changed tactics. Now, they are pretending to be “Right” and they are marketing the con to Republicans. Our State Legislators are, for the most part, jaw-droppingly ignorant of our two Founding Documents. And too many Republican Legislators believe whatever the fake “Right” con-con lobby tells them. Many Republican Legislators, who don’t understand our Founding Principles and Founding Documents, go by the labels which others assign. And since they are told that an Article V convention is the “conservative” position, they go along with it. So Republican State Legislators who have been bought and paid for, or who go along with their Leadership, are the ones today who are doing the work of the Left by passing applications for an Article V convention. Most of them have no idea of the dangers. In some States (e.g.,Texas, North Carolina), the Republican leadership prohibits their members from hearing voices in opposition at Committee meetings. SJR 36 passed the North Carolina Senate with no public notice of the Committee hearing. Only former US Senator and COS operative Tom Coburn was given advance notice so he was able to attend and speak in support of SJR 36. But those of us on the genuine Right got no advance notice and our voices were not heard at that Senate Committee meeting. At the hearing on June 28 before the North Carolina House Judiciary Committee IV, the sponsors of SJR 36 were given all the time they wanted to speak for SJR 36; but our Friend, Wynne Coleman, was only allowed one (1) minutes to speak in opposition. One Legislator who opposed was also given only one (1) minute. And that was it for the opposition at this public hearing. I suggest that the reason the bought and paid for State Republican Legislators prohibit voices in opposition from being heard is that they know that when Legislators are given the TRUTH, they generally oppose an Article V convention. So We are in imminent peril of losing our Constitution. It seems that what the Fake “Right” now wants is to move us into the North American Union (NAU). Under the NAU, Canada, the United States, and Mexico basically merge, and a Parliament is set up over them. The borders between the 3 countries are to be effectively erased. I have read the Task Force Report on the NAU sponsored by the Council on Foreign Relations. The globalists (George W. Bush, the Cruzes, etc.) need a new Constitution for the United States which transforms us from a sovereign nation to a member state of the NAU. How do they get a new Constitution? At an Article V convention. How do they get an Article V convention? By lying to the American People and to State Legislators, and by preventing voices in opposition from being heard. I suggest we better make defeating an Article V convention a primary focus of our lives. Please get with your State Legislators and educate them. Warn those in your spheres of influence. We must get States to rescind their existing applications for an Article V convention. This past legislative session, 3 States (Maryland, New Mexico, Nevada) rescinded their outstanding applications for an Article V convention! But that took lots of work by many people. If you want to know what America will look like once the Parliament for the NAU takes control of immigration, look at Europe. And pray that you aren’t disarmed under the new Constitution. Visit http://tarheelteaparty.org/?page_id=1186 to learn more on why you should not want a Convention of States. 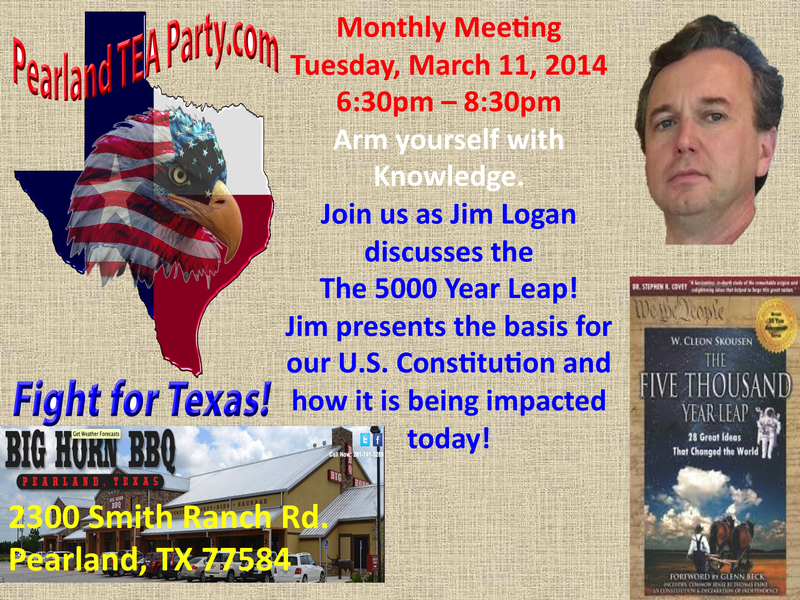 Pearland TEA Party Says ‘YES’ to Stovall – – – ‘NO’ to Stockman! For months the Board had been vetting out the entrants into the U.S. Senate race for the Great State of Texas and after the filing deadline it became glaringly clear that there was only one candidate that we in good faith could support and endorse, Dwayne Stovall. He advocates several policies that we clearly support. First and foremost he is in favor of returning to the concept of Texas First. The 17th Amendment to the Constitution in essence ended Federalism or any opportunity the States had to veto Federal authority. It changed the election of U.S. Senators to a popular vote as opposed to elected by each States legislature. He supports returning the Federal government back to a limited government and allowing the states to have more control over the Federal Government. He also, by his very presence in the race, highlights that the Federal Government was intended to be a Citizen Legislature. It was not to be dominated by Lawyers and a Permanent political class. He has been very good at educating everyone he meets on how the Constitution was intended to operate. Based on our questions and conversations he has met all of the qualifications laid out in the bible and more. Based on a unanimous vote the entire board enthusiastically endorses Dwayne Stovall for United States Senator. 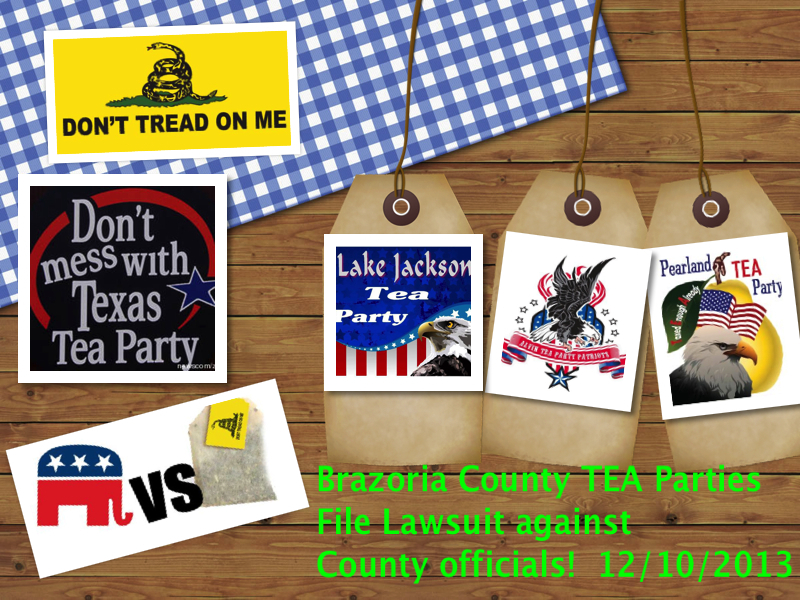 Since October 23, 2012, the TEA Parties of Brazoria County have suffered repeated abuses at the hands of the County Commissioners and District Attorney Jeri Yenne. On that date, District Attorney Yenne presented her “interpretation” of the Texas Constitution to the County Commissioners. In that presentation, Yenne proposed that the Constitution forbade the use of county facilities by any group that was not granted funds by the state. Yenne proposed, and the Commissioners adopted, a rule that stated that the county facilities could not be used for a private purpose by any private entities or individuals. The TEA Parties of Brazoria County were contacted the same day and told that they could no longer use county facilities for their public meetings. No other group was removed from the use of county facilities under that new rule. The TEA Parties were the intended victims of the Commissioners and D.A. Yenne. Despite having been shown that Yenne’s “analysis” of the Texas Constitution was incorrect, at best, the Commissioners refused, and continue to refuse, to get outside counsel or to seek the opinion of the Attorney General’s office as to whether what they had done was allowed by the Texas Constitution. The TEA Parties have repeatedly requested that the Commissioners reconsider what they had done and to order the D.A. Yenne to allow the TEA Parties the use of several county facilities as they had done for years before this set of events. The Commissioners have repeatedly deferred to D.A. Yenne who, without a reason, steadfastly refuses to allow the TEA Parties the use of those facilities. 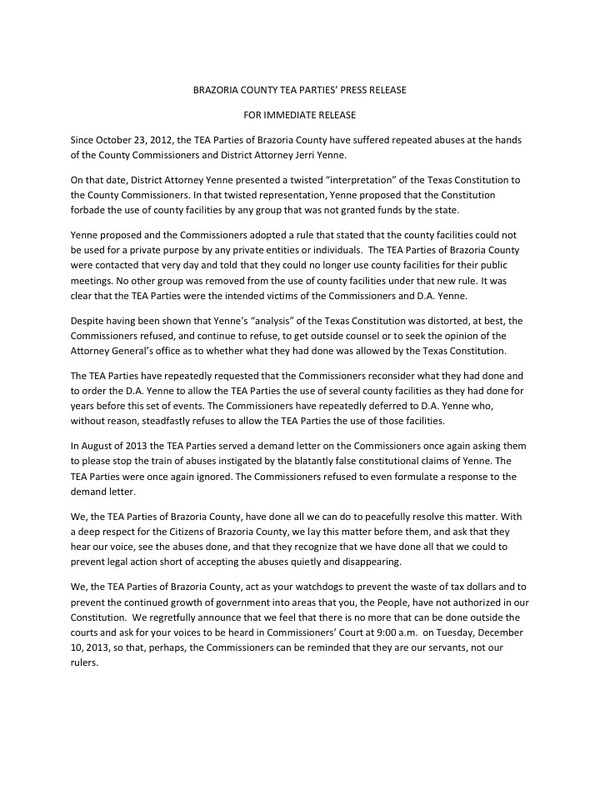 In August of 2013 the TEA Parties served a demand letter on the Commissioners once again asking them to please stop the actions instigated by the inaccurate constitutional claims of Yenne. The TEA Parties were once again ignored. The Commissioners refused to even formulate a response to the demand letter. We, the TEA Parties of Brazoria County, have done all we can do to peacefully resolve this matter. With a deep respect for the Citizens of Brazoria County, we lay this matter before them, and ask that they hear our voice, see what has been done, and that they recognize that we have done all that we could to prevent legal action short of accepting the abuses quietly and disappearing. We, the TEA Parties of Brazoria County, act as your watchdogs to prevent the waste of tax dollars and to prevent the continued growth of government into areas that you, the People, have not authorized in our Constitution. We regretfully announce that we feel that there is no more that can be done outside the courts and ask for your voices to be heard in Commissioners’ Court, ground floor, 111 E. Locust, Angleton, TX, 77515, at 9:00 a.m., Tuesday, December 10, 2013, so that, perhaps, the Commissioners can be reminded that they are our servants, not our rulers. 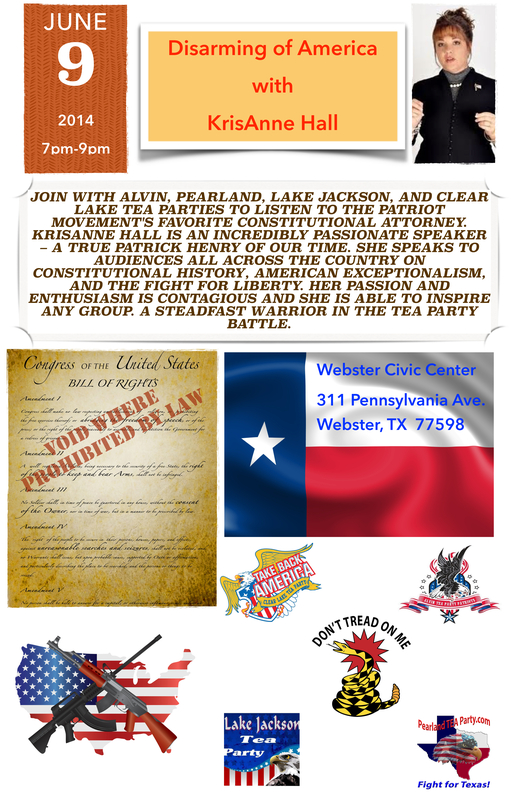 Join us against Tyranny in Brazoria County where Texas began!! 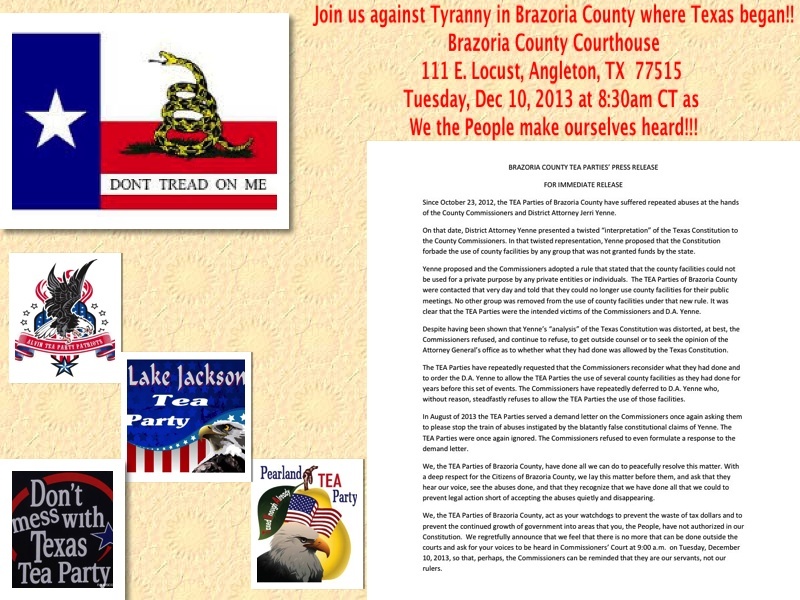 Brazoria County Courthouse 111 E. Locust, Angleton, TX 77515 Tuesday, Dec 10, 2013 at 8:30am CT as We the People make ourselves heard!! !